National parks became the poster child of the 2013 government shut down. Barricades were put up around national treasures and on the National Mall, people clambered over them, Congressional grandstanding took place at the World War II memorial. Republicans were pretty resoundingly blamed for the mess. Now another government shutdown is mere hours away. Republicans are again being blamed, and federal lands are again at risk of being a public relations battleground. A shutdown would mean thousands of employees, including park rangers, would be furloughed while Congress attempts to get its act together. The Trump administration, perhaps learning from the nightmare last time, is planning to approach national parks a bit differently should the government shut down. The Department of Interior has sent guidance to local park officials telling them that “park roads, lookouts, trails and open-air memorials will generally remain accessible to visitors.” It’s meant to be a win for the public, but that’s a tough sell given the Trump administration’s regressive public lands and wildlife policies. And, it turns out, making sure parks “generally remain accessible” could end up being a nightmare for visitors, as well as the wonders parks are meant to protect. In a statement to Earther, National Park Service spokesperson Jeffrey Olson said “that roads that have already been open will remain open (think snow removal) and vault toilets (wilderness type restrooms) will remain open.” As they did during the 2013 shutdown, law enforcement rangers will also continue their duties in order to keep the peace. But it takes a lot more than roads and pit toilets to make a park function. Visitors will miss out on being able to talk with a park ranger who knows the history, museums, and other resources that tell the rich history of the park. But really, the bathroom situtaion is the biggest concern. As a former park ranger, I can tell you this is absolutely true. “Where’s the bathroom?” is far and away the most popular visitor question. When it’s not readily accessible, things can go downhill in a hurry. What happened at Glacier National Park during a warm spring a few years ago—when the park was fully staffed no less—is instructive of how visitors can behave when their basic needs aren’t met. “People were kicking in the door to restrooms even though plumbing wasn’t on and they crossed gates into closed areas,” the park’s superintendent, Jeff Mow, told me at the time for a story on how climate change is affecting parks. While Glacier public information officer Lauren Alley told Earther that the park will have pit toilets available, other parks don’t necessarily have any easily accessible. At Crater Lake National Park, a place where yours truly worked, the winter restroom options are indoors, along the rim of the lake and at the main visitor center. All visitors centers are considered non-essential so will be closed, though gift shops operated by outside concessionaires can remain open, and could offer a workaround to keep some flushable toilets open. Things could get messy fast, even with the tiny trickle of winter visitors Glacier, Crater Lake, and other snowbound parks receive. For parks like Death Valley, Arches or any of the National Park Service-managed sites in South Florida, now is prime time to visit because of the mild weather. With fewer rangers on staff, there are both fewer eyes to make sure visitors are safe, and to make sure they don’t wander into places they shouldn’t for ecological reasons. Rangers help educate people about the delicate cryptobiotic soil that forms a living crust on the ground they shouldn’t go tramping across in Arches. With nobody to share that message, visitors could unwittingly cause damage that will take 5-7 years to heal under the absolute best circumstances. Other parks with significant archeological resources could be at greater risk of looting with fewer eyes on resources. And unlike the soil, once they’re gone, no amount of time can bring them back. 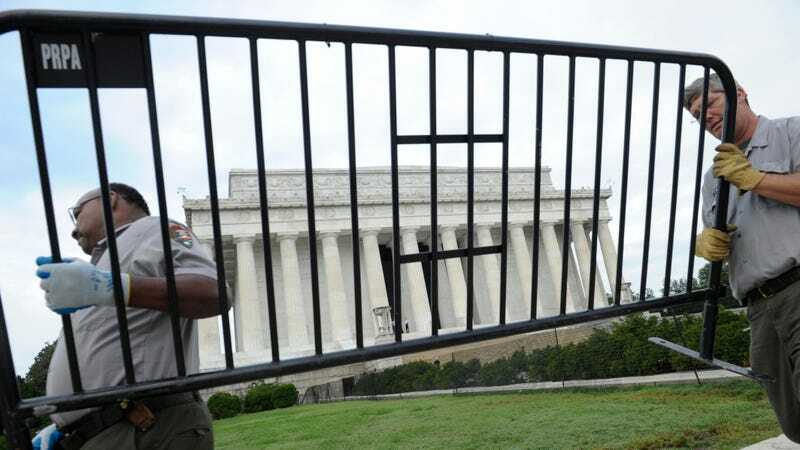 “Even when they are fully staffed, rangers are challenged to prevent vandalism, looting, and even damage to plants and other sensitive resources that visitors can harm accidentally,” The National Parks Conservation Association wrote ahead of the 2013 shutdown (emphasis theirs). The same holds true today. “Keeping parks open without full staff is a needless risk and potentially dangerous, both for the resources we are supposed to protect, and the visitors’ safety,” a 12-year veteran park ranger, who asked to have their name withheld because they still work for the agency, told Earther.